If you stay near Manchester, note that flights from Manchester to Johannesburg are sometimes cheaper than flights from London to Johannesburg (somebody explain that!). A lady gives birth on Virgin Atlantic London Heathrow - Joburg flight VS601J. A bed was made out of pillows at the back of the aircraft, by helpful Virgin cabin crew. "It was one of the most amazing experiences of my life. The crew and the passengers were fantastic. It was a real team effort and they all rallied round to help the mother and her newborn baby. It all began a couple of hours into the flight when the passenger complained of stomach pains. We quickly realised that she was pregnant and that the baby was coming very soon. The crew made a bed of blankets and pillows at the back of the plane to make her as comfortable as possible. We gave her water, held her hands and coached her through the birth. It all happened so quickly. One minute we were delivering drinks to the passengers and next we were delivering a baby. It was so emotional and when the pilot made an announcement over the PA system the whole plane gave her a round of applause. It was fantastic.” said Emma Goodman, Cabin supervisor. The plane was diverted to Palma, Majorca, where the mother and her newborn underwent medical checks. Air Namibia suspends its flights between London Gatwick & Windhoek (Namibia). The British built Comet ushers in the jet era of passenger flight with its maiden trip from London to Johannesburg. 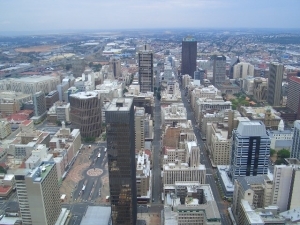 A direct non-stop flight from London to Johannesburg takes some 11 hours. Flying from London to Johannesburg via Cape Town is not the shortest route, and probably not the cheapest route. However, if you want to see Cape Town's beaches before you head north to Johannesburg, you may wish to check the price of (1) flights from London to Cape Town, (2) flights from Cape Town to Johannesburg (there are buses, trains and low cost carriers flying this route). The shortest flight path from London's Heathrow airport to Johannesburg's OR Tambo Airport is illustrated. An initial heading of 154° (South-East) is followed from London Heathrow (51°28'39"N 00°27'41"W), from which it is a distance of 9046km to Johannesburg's Oliver Reginald Tambo Airport (26°08'21"S 28°14'46"E). If you're looking for flights going the other way then check out our Johannesburg to London Flights page. A bit of history. The world's first commercial flight in a jet aircraft occured on the 2nd May 1952, when in the afternoon a de Havilland Comet flew 36 fee-paying passengers from London to Johannesburg. The flight was arranged by the British Overseas Aircraft Corporation (BOAC) and had stops in Rome, Beirut, Khartoum, Entebbe and Livingstone.